Simon Allen heads out on tour with the more compact model in the range to see how it performs in a busy live setting, and whether it could give the major players in this sector a run for their money. From an end-user’s point of view, the digital console market is really exciting today. While technology follows its natural progression, thankfully prices have fallen considerably in this sector. This has led to the market moving extremely quickly and now many of the low to mid-priced consoles have feature sets compared to those that would’ve cost tens of thousands of pounds just a few years back. As a result, manufacturers having to up their game while keeping costs to a minimum must be quite a challenge. Of course, less moving parts and fewer analogue electronics are required, which keeps costs down, but a lot of research and development must now be poured into software programming and how that will interface with the user. 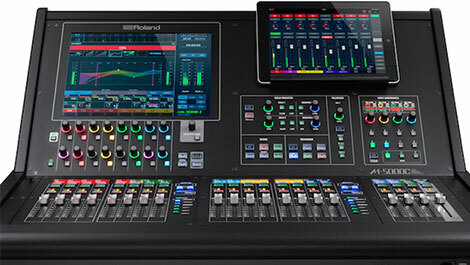 Touchscreens aren’t exactly cheap either, and the M-5000 from Roland Pro A/V has quite a large but highly detailed one. When introduced to the M-5000 for the first time you are greeted with the acronym ‘OHRCA’, which stands for ‘Open High Resolution Configurable Architecture’ and highlights a few principles that the console is built upon. ‘Open’ alludes to the variety of input and output formats that it can operate with. Roland is known for its own ‘REAC’ protocol that all of the brand’s consoles and digital stage boxes use, and it was one of the first manufacturers to develop the digital snake concept. As well as this connectivity, however, there are two expansion card slots, which enable the use of other protocols such as Dante, MADI and even Waves SoundGrid. This is great news of course – and something I made good use of during my review – but it has almost become an expectation for modern consoles. Even without any option cards installed, though, the M-5000 is very powerful. There are two main REAC connections for stage boxes, and a third for hooking up to a monitor console, other monitoring options or for redundancy. There’s also a 16 x 16 USB audio interface for laptop recording and playback. The desk has substantial local I/O, which is great to see as some modern controllers can feel limited. The M5000 has 16 XLR analogue inputs and 16 XLR analogue outputs, and the M-5000C, which I used for this review, has just eight outputs. To be honest, besides this small difference in local I/O and eight fewer physical faders on the M-5000C, that’s where the differences end. The processing power is exactly the same. This is quite surprising as the frame size of the M-5000 is much larger and yet I managed to get the M-5000C, plus it’s very substantial flight case, into the boot of my estate car. Next up in OHRCA is ‘High Resolution’. This refers to everything in the M-5000 system running at a 96kHz sampling rate and 24-bit, end to end. All of the Roland stage boxes have been capable of running at 96kHz, but the M-5000 defaults to this. All the processing inside the mixer is also carried out at 96kHz, with a summing mixer running at 72-bit. If you do the maths, that’s a tremendous amount of headroom. Many consoles are now running at 96kHz of course, but the big news here is that there aren’t many offering that, along with this channel count, in this price range. What is the channel count I hear you ask? Well the final part of OHRCA is ‘Configurable Architecture’. Both M-5000 systems offer a total of 128 freely assignable audio paths. From this pool you can build the mixer however you like – you can choose any number of input channels, auxiliaries, groups, matrices and mains. There are also downmix and mix-minus busses, which are features typically only found on dedicated broadcast consoles. Roland supplies a few templates to get you started, but the M-5000 shouldn’t really be considered just as a live sound console. Unfortunately, I think this is a message the industry has missed. ‘Configurable Architecture’ doesn’t stop there either. One of the M-5000 party pieces is the fact you can change the configuration mid-show. If you need to add channels, or swap some of your system resources from auxiliaries to groups at a festival, for example, you can be doing that during the previous act. There isn’t any drop in audio and you only lose control of the mix for two seconds. Again, there are now consoles that can do this too, but typically not in this price range and quite so flexibly. I took the M-5000C on tour for a week with a band that I work with regularly. This provided me with material I knew well so I could therefore concentrate on the desk and of course the sound. To add to the technicalities, the band was going to be fully on stereo in-ear mixes. This was partly because we’d decided to and partly because I was also road-testing the new KLANG:Fabrik 3D in-ear mixing system. We didn’t have the luxury of a monitor console and needed to arrive at each venue with six-way stereo IEM mixes ready to go. This meant I could really put the M-5000C through its paces. What may have appeared to be a simple input channel list of around 20 channels soon ended up with around 64 signal patches. Let me just state for my own sanity that I’m not one to over-complicate a setup, but once this was configured for the tour it made everyone’s lives extremely easy. Firstly I soft patched a Y-split of the input channels onto the desk so I could operate a FOH mix independently to the channel settings going to the band’s IEMs. We then ran direct outputs post channel processing to the KLANG system via Dante. The post-gain direct outputs of the FOH channels where then also routed via the Dante network for multichannel recording onto Pro Tools. Why is all this relevant to reviewing the console? Well, there were a number of ways in which the M-5000C facilitated this in some surprisingly efficient ways. Firstly, the M-5000 offers three inputs for each input channel. There’s obviously the main preamp, in this case the preamps on an S-2416 stage box and an alternative input, which could be used with spare wireless microphones for example. This saves copy-pasting settings to a different channel when the spare mic is needed, so all that’s required is just swapping the input source. The third input acts like a tape machine playback input, which in the modern live sound world we refer to as the virtual soundcheck input. Virtual sound checking was really useful on this tour, not just for me but also for the band to make sure they were happy with their own IEM mixes, giving them a chance to work on their personal mixes with everyone playing. The M-5000C made this extremely easy compared to other similarly-priced consoles that still require manual patching. There are a few key points to note here. Firstly, the M-5000C facilitated all this patching with ease, between what was soon becoming a notable Dante network and its own REAC connections. The KLANG’s Dante outputs that were routed to the REAC stage box didn’t add to the total of 128 assignable audio paths, therefore leaving the console with a huge amount of spare power. Finally, with a GB/sec network switch I could have all the Dante in and outs going to Pro Tools and KLANG then back to the stage box with zero complaints about latency. I was quite impressed by this because that’s quite a number of cross-platform digital patches with a lot of processing involved before you even add the latency of the digital wireless system itself. I should also add that the whole system was extremely reliable. Every night the system was powered up and we were ready to go, without any crashes or loss in audio. In terms of typical channel features and the general operation of the console, it’s really intuitive to use with pro features that sound great. Everything you would expect a serious mixer to offer is there and almost every feature is easily found. I have to confess however, that I did have to read the manual once to learn where the matrix mixer was. This might seem silly, but to access this window it is a separate item on the menu, which doesn’t follow how the rest of the console behaves. This is a small detail though and once I did find it, the matrix mixer was naturally comprehensive. Every manufacturer approaches channel navigation in a different way. Most digital consoles today can deal with many more multiples of channels than there are physical faders. Getting to what you need has to be fast and efficient. With the M-5000, Roland has introduced a truly fantastic feature called ‘Anchor Points’. Along with the usual scrolling and DCA spill techniques, users can set anchor points to any channel, then via two clicks can return to that point in the channel list very quickly. Sonically the whole system was extremely clean and handled transient-rich content, such as drums, in a natural fashion. The 72-bit summing at 96kHz sounds fantastic and the basic channel tools such as EQ and compression are very powerful. Perhaps it would be nice to see a selection of high-pass filter curves on the EQ’s in a future update, but otherwise it’s excellent. I think I personally struggle with some of the Roland reverbs as I find them busy, but I think that can be put down to personal taste. The console’s effects section is extremely well loaded with many of their signature effects. Once I’d had time to play with the reverbs I was happy with the results. The Dynamic EQ, which I used as inserts over the vocals sounded great and was very useful. Unfortunately Roland faces a problem with this desk. When you think of a console of a similar spec, you don’t initially think of the brand. On top of that, the price could put some people off as they might assume it’s not up to the job. However, the truth is this is a very powerful and reliable system that should keep even the most experienced engineer smiling. The expansion cards and ‘Configurable Architecture’ of the desk should see it in service for many years to come. All-in-all the M-5000C was a clean and professional sounding system which felt very natural to use. The feature set and some of the operational behaviours hark towards consoles that are several times more expensive than this. The M-5000 will facilitate a huge number of applications with enough power for some of the largest events where alternative solutions will mean a significant price increase.